I missed the start of the Nature Journal Club's field trip to Peters Creek Falls (near Saratoga, California), so M. and I set out to find the waterfall on our own in the afternoon. We parked at the Peters Creek trailhead on Skyline Boulevard, and M. brought along his mountain bike. Unfortunately I didn't research the actual location properly so we hiked the length of Peters Creek trail not realizing we should have turned off on another trail. No cell signal to look it up en route = no sighting of the falls. 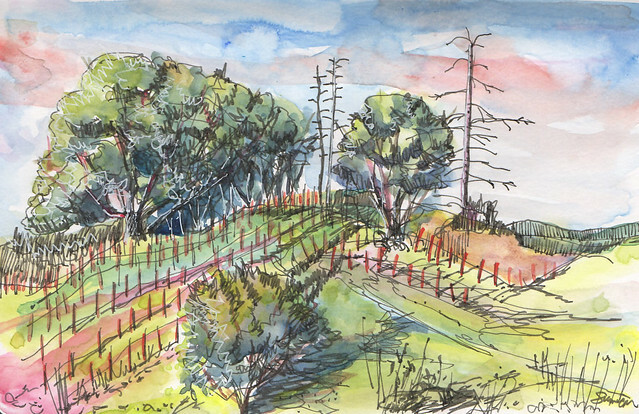 Instead of hiking all the way back, I turned up a side trail to the main road and got a quick sketch in of the hillside while waiting for M. to bike back to the car and pick me up. The dark line work was done with my much-loved (but neglected of late) Lamy Safari fountain pen, filled with Noodler's Lexington Grey. It had started leaking a bit after airplane trips, so I'd put it away intending to clean it. Recently I brought it out and topped up the ink. Glad I did -- it has such a lovely, responsive line quality. Before the next refill I'll flush it out with pen cleaner.